Billet Yard | Quad Infotech Inc. The Billet Yard Management functions are fully integrated throughout the Scheduling, Melt Shop and Rolling Mill functions of QMOS. It provides many features to the users that are unique in the industry. Advanced billet allocation tools, user friendly touch screens for crane operations and electronic information centers are a few examples of such features. QMOS enables users to quickly search the billet yard for the best fit billets for a given order. Advanced filters narrow down the search by order requirements. Aside from the typical factors such as grade, size and length, billets can be selected based on their chemistry results, predicted physical properties and expected yield. When allocating billets to an order, crucial information is made available to the scheduler to facilitate the planning. This information includes the estimated start time of the order, the position of the billets within the stacks and more. At the end, QMOS creates a complete movement plan for the cranes. QMOS provides simple, user friendly touch screens for use by the operators of the cranes and fork lift trucks. All crane and fork lifts are equipped to report all billet movements in real-time. The hot charge process can vary from one mill to another. QMOS provides fully configurable hot charge functions to fit to any process with minimum to no customization. All hot charging activities can be planned through the QMOS scheduling tools and executed by the billet yard functions. QMOS keep full track of the hot charging performance by providing four types of charging: super-hot, hot, warm, cold. QMOS provides a mobile solution for inventory checks. The QMOS user can move through the billet yard using a mobile hand-held device and perform a partial or full physical count of the inventory. Once completed, the mobile unit will connect and synch with QMOS. Any discrepancies are identified and proper instructions are provided top the user to synch the physical inventory with QMOS. No need to track your inventory on a white board any longer. QMOS provides a real-time, fully configurable view of your billet yard. 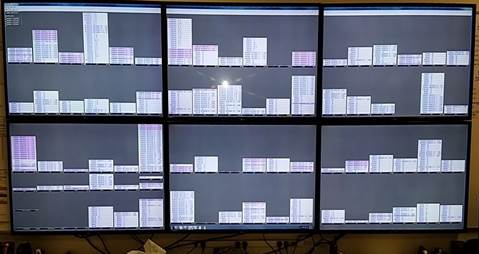 This layout can be displayed in a single or a matrix of monitors depending on the size of the billet yard. Billet Yard Live provides a real-time look at the yard and each individual stack. Search tools enable the users to quickly search for billets by heat, grade, size, length, upcoming rolling orders and much more. A host of reporting tools is provided for keeping accurate track of billet inventory over time. Transactional data is stored whenever changes are made to billet inventory, with the ability to look at inventory levels and changes for any time range. Accounting periods can be set up to track inventory adjustments after month end. The information can be viewed at a high level, grouping by grade, and drilled down to look at counts for individual heats.